The more skilled I became at fasting, the more I changed between juice and water fasting. I found the cleansing to be deep and during the water there was no hunger. I only craved juice. Alternate between water and juice fasting is great when you need the energy to work or get things done. So when I was working I juiced, then water fasted for the weekend and just laid around in bed and read or relaxed. The most energy I out out was a relaxing walk. 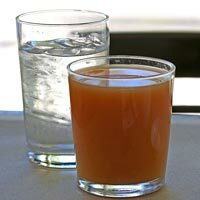 By cleansing with juice first, water fasting is more comfortable. Water fasting should always include two of three days of juice fasting before and after the water fast. This alternating between juice and water fasting is the most effective method of achieving a full cleansing through fasting. It is possible to start a seven-day water fast with a thirty-day juice fast. I accomplished this twice and experienced an indescribable peak that lasted for three days by drinking fresh-made juice after the water fast. Definably the most incredible fasting experiences of my life. After 7 days of water fasting the juice hit my blood like drug. In seconds, my body flooded with energy and I jumped on the bicycle and hit the hills with ease. There was no fatigue just the energy that kept coming with this clean, connected to everything, oneness better than any drug high. AH thank you, this post was exactly the answer to the question I had.